Ironically, improvements and cost reductions in electric motors and batteries will help the internal combustion engine (ICE) through hybridization. These cost reductions combined with substantial engine downsizing can make hybrid drivetrains cheaper than conventional ICE drivetrains. In addition, future hybrids will avoid the large trade-off between power and efficiency of pure ICE cars, leading to broad consumer acceptance. Fuel cell vehicles will follow the same downsizing philosophy to keep the high cost of the fuel cell stack to a minimum. In the previous article, I outlined the main arguments why the internal combustion engine (ICE) will remain highly competitive with battery electric drive even as battery prices continue to decrease. This article will go into more detail about what these highly competitive ICE drivetrains might look like. Even though the future is less certain for fuel cell vehicles, this technology will also be included in the discussion. Fact: The internal combustion engine (and any other heat engine) functions best under constant load. If the engine can constantly work near its optimal operating point, efficiency and longevity increase dramatically, complexity and costs reduce, and emissions control becomes much easier and cheaper. Electric drive, on the other hand, is great for variable loads. Efficiency remains high, maximum torque is available even at low power output and mechanical energy can be efficiently recovered to electrical energy under braking. Hybrid drivetrains aim to synergistically combine the internal combustion engine and the electric motor to fully capitalize on these fundamental characteristics. Even though hybrid drive has been around for about two decades, great room for further improvement exists. Continued cost reductions in electric drivetrains and battery technology combined with further development of ICEs especially designed for hybrid drive can lead to higher efficiency, lower costs and a better driving experience. To better understand the potential of hybrid drive, it is important to realize just how little power it takes to maintain constant speed (the role of the ICE) and how much power it takes to accelerate (the role of the electric motor). To illustrate this, three simple graphs are presented below. 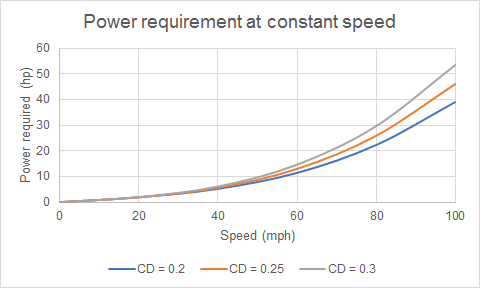 The first graph shows the horsepower (hp) required to maintain a given constant speed for a car weighing 3050 lbs with a frontal area of 22 ft2 (typical Toyota Prius numbers) for different drag coefficients (source). Even at a speed of 60 mph, only 11-15 hp is required. The thing that really takes many horses is acceleration. 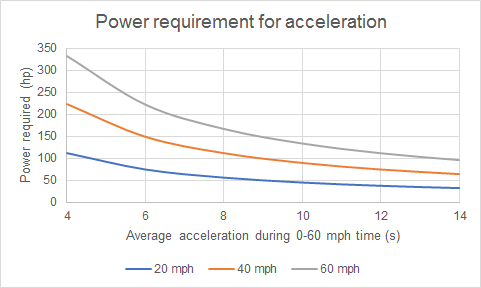 As shown in the graph below, accelerating even at a fairly modest rate equivalent to a 10 s 0-60 mph time takes almost an order of magnitude more power than maintaining speed at 60 mph. 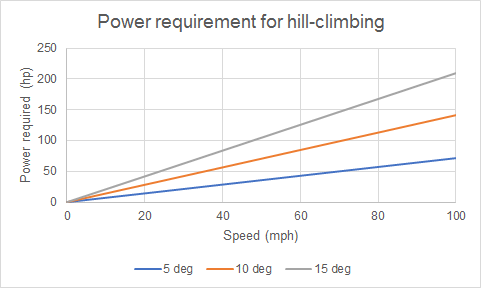 Hills also require quite a lot of power depending on the gradient. For these simple reasons, the hybrid of the future will have an engine that has substantially less power than the electric motor. The engine will be responsible for most constant speed driving, while the electric motor will provide the short bursts of larger power required by acceleration and steep hills. Based on the above graphs, no more than 50 hp will be required for an ICE in a standard car. This ICE can then be complemented by a 100 hp (or stronger) electric motor with about 5 kWh of battery capacity to provide enough flexibility for longer periods of higher power (e.g. getting up a mountain pass). Naturally, the worst-case scenario for such a car is running out of battery, leaving you with only 50 horsepower (which is still much better than running out of juice in a BEV). Under regular driving conditions, however, it will be near-impossible to exceed 50 hp for a sufficiently long time to drain 5 kWh of battery capacity without breaking several traffic laws. The battery can be recharged through the engine whenever fewer than 50 hp is required to move the car, through regenerative braking, or through a waste-heat recovery system. The parallel hybrid configuration will be preferred to avoid the efficiency losses related to using an ICE just to drive a generator (series hybrid). In fact, a generator can be completely avoided since the motor can double as a generator in the parallel configuration. Furthermore, a smaller motor can be used since the power of the ICE goes directly to the driveshaft. With the electric motor having at least twice the power of the ICE, it may be most cost effective to let the electric motor drive the rear wheels and the ICE the front wheels, thereby allowing a downsized ICE transmission system. Given that the ICE will only need to drive the car at cruising speeds, the transmission can be quite simple and cheap. In this system, the engine does not need to operate under rapidly varying loads. Current hybrids already employ an Atkinson cycle engine which boosts efficiency at the expense of performance at lower loads (where the electric motor does all the work). New HCCI engines could potentially drive engine thermal efficiency to the milestone of 50%, relying on hybridization to avoid ignition control issues under variable load. Diesel could even make a comeback thanks to easier emissions control from a largely constant power output and a larger battery pack allowing all electric drive in population centers. How low could the cost go? This powertrain performs well in a cost comparison with pure ICE and BEV alternatives. The graph below shows a breakdown of a future 150 hp car in three configurations. Cost assumptions are $50/kW for the ICE and transmission, $25/kW for the electric motor components (source), $100/kWh for the BEV battery pack and $200/kWh for the hybrid battery pack. A simple 2-clutch system to connect the ICE to the motor for charging the battery is assumed to cost an additional $500. As seen above, the hybrid powertrain performs very well in this cost comparison. Maintenance costs of this future hybrid configuration will also be low thanks the the small ICE operating mostly at constant loads. Today’s leading hybrids are already showcasing this potential. For example, 5 years of maintenance of the Prius costs only $450 more than for the Leaf (while insurance costs are $330 less). It will be quite a few years before such hybrids start to emerge though. Currently, an electric motor and power electronics cost almost as much as a gasoline engine and transmission, and batteries are still expensive (and unsubsidized for hybrids). Hybrids therefore typically have a small battery pack (~1 kWh) that limits the power and utility of the electric motor. The current cost comparison is given below to show that the proposed hybrid system would be significantly more expensive than a standard ICE. Another important development that will enhance the hybrid configuration described above is waste-heat recovery systems. Technologies such as thermoelectric generators, electrical turbocompouding and organic Rankine cycles can convert a small percentage of the waste heat from an ICE to electricity to continuously charge the battery whenever the ICE is operational. This can allow the hybrid to keep the battery pack charged without requiring extra work from the engine. Good technological development in this field can eliminate the need for any physical connection between the engine and the electric motor, thus offsetting some of the cost of these energy recovery systems. Additional engine downsizing allowed by the efficiency gains offered by these systems will further decrease costs. The future hybrid configuration with a greatly downsized ICE will bring at least two significant side-benefits. Firstly, the hybrid configuration with a large electric motor will be more fun to drive than a pure ICE car. Currently, the hybrid image is still linked to the old Toyota Prius, which was very sluggish to drive. According to the vast majority of professional reviews, this stigma is already being altered by the new Prius and the Hyundai Ioniq. Future models will certainly continue this positive trend. As a result, people will start to buy efficient cars, not as a grudging compromise to help the environment, but simply because they are both cheaper and better to drive. Hybridization is already being used to increase performance in sports cars, the pinnacle of which is Mercedes’ 50% efficient F1 engine (see the YouTube video below). Secondly, the moderately sized battery pack (~5 kWh) in the future hybrid configuration described above can also be charged from a regular plug overnight. Even though, on average, fuel costs for gasoline and electricity will not differ much for such an efficient hybrid vehicle, adding a plug provides fuel flexibility in the case of high oil prices. Even just a moderate number of such flex-fuel vehicles can provide enough demand elasticity to prevent fuel price spikes. For example, if oil prices start to rise outside of the normal range, everyone with these vehicles can instantly start displacing some of their gasoline consumption with electricity, thus reducing demand for oil and lowering the price. The fuel cell vehicle of the future will operate on much the same principles as the ICE hybrid described above. Given that the fuel cell is the most expensive part of the configuration, it will be kept to an absolute minimum size and will be mostly responsible for constant speed driving and gradual battery recharging. Acceleration and hills will be handled by conventional battery electric drive. Future fuel cell costs are highly uncertain, but $50/kW appears to be possible. The hydrogen storage tank also represents a non-negligible cost of about $1500. To illustrate overall cost implications, the cost of a fuel cell drivetrain is added to the above graph. It is shown that the FCV drivetrain is substantially more expensive than the ICE alternatives, but still cheaper than the BEV. Where will the fuel come from? 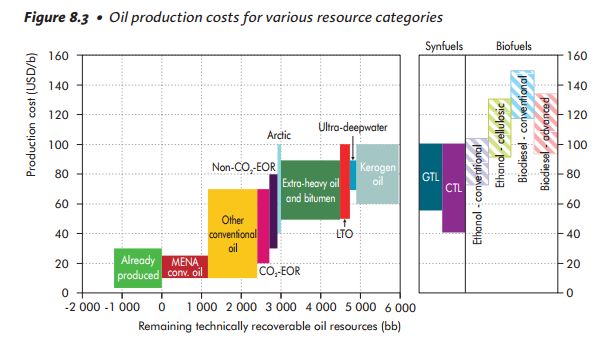 Even though we still have lots of cheap oil (below), we will eventually have to move to more sustainable sources. CO2 emissions from the combustion of oil-derived fuels will also become a more important economic consideration over coming decades. The next article will therefore take a look at different ways of producing sustainable fuels for the long-term future.